2 Bed/2 Bath Villa. Biennial Use, Even & Odd years available. Platinum Season, Island View. Island View, 2 Bed and 2 Bath Villa, Platinum Season, Annual Use. This owner has 2 of these for sale. Buy one or buy both for the extra benefit. Also reservations are in place for 2019. Two Bed, Two Bath, Oceanview, Floating, Platinum Season. November 2019 reservation in place to transfer to the new owner. Seller has two weeks at this price. Make an offer for both! Marriott's Waiohai Beach Club timeshares are a luxurious getaway located on Kauai's natural, unspoiled south shore. On Poipu Beach, you will be right in the middle of the sun and fun that Hawaii has to offer. 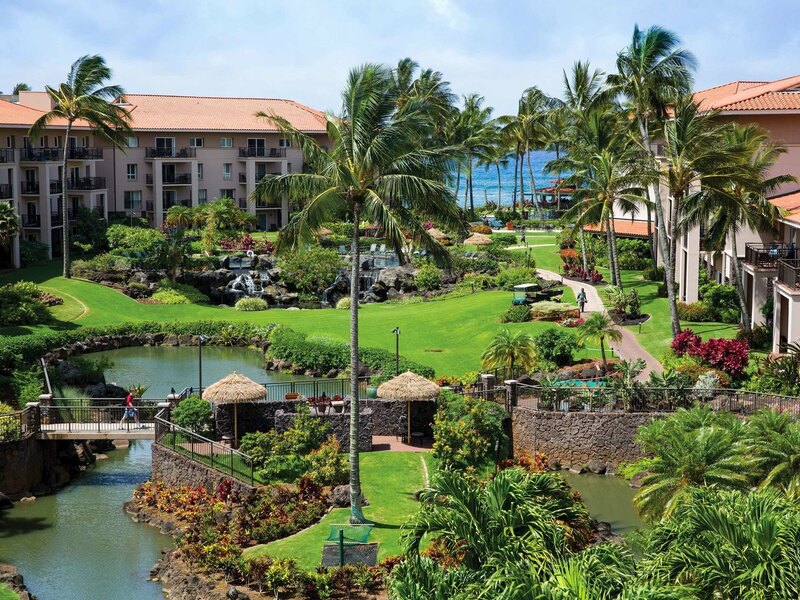 Don't miss your chance to buy a Marriott's Waiohai Beach Club timeshare resale. All of the amenities at Marriott's Waiohai Beach Club combined with picture perfect beaches make it easy to decide to buy a timeshare resale in paradise. Imagine waking up in an exclusive and private 2 bedroom, 2 bath villa that looks out over the ocean awaiting you just outside. Entertaining guests won't be a problem with the separate living room and dining room right there in your villa. You'll feel right at home in the master suite with private balcony and washer and dryer. Get ready to be pampered in the master suite's large soaking tub and private lanai where you will be sure to take in all the lovely views the island has to offer. Just minutes from Marriott's Waiohai Beach Club is the quaint little town of Koloa, Hawaii. It is well known for its old Sugar Mill Plantation and for being so close to amazing recreational activities. Almost any outdoor activity you can think of can be done here. Enjoy swimming and scuba diving, fishing and boating, and the beautiful and famous Kiahuna and Poipu Bay golf courses are only minutes away. Explore Poipu Beach, and you'll find natural reefs and tide pools with some creatures and fauna that are only found in Hawaii. Or you can take a cruise to the Fern Grotto and be serenaded by traditional Hawaiian musicians. The trip up to the grotto is an enjoyable boat ride on Hawaii's only navigable river, Wailua River. Lava rock and tropical ferns greet you on your way there. You don't even have to leave the resort grounds to have the most amazing vacation you will ever have. There is always something to do for every member of the family. Enjoy a bite to eat at the Kiawe Grill. The kids can have fun at the Waiohai Beach Club Keiki Playground, or the children's activities center. Mom and dad can have a pampered day at the spa right at the resort just outside their Marriott timeshare. There are a number of beautifully landscaped and pristine swimming pool areas, some for families, and some located in private areas just for the adults. A fitness center is conveniently located right on property. You can take advantage of the beachside bar while you're sunning yourself right outside on the golden sands of Poipu Beach. If you decide to stay in your room, you will be thoroughly entertained by the three televisions provided in your villa. Be sure to bring your laptop or wireless device and take advantage of the free high-speed Internet and WiFi available. Wouldn't you want a piece of Marriott's Waiohai Beach Club fractional ownership? Owning a piece of paradise is not an offer that comes along everyday. Or, if you are looking to sell a Marriott's Waiohai Beach Club timeshare, you are in luck because the Marriott's Waiohai Beach Club timeshare resales are in high demand. Right now Marriott's Waiohai Beach Club timeshares are for sale at a competitive rate that you just can't miss out on. The freedom to make your Marriott's Waiohai Beach Club timeshare vacation personally yours is only limited by your imagination. Make your vacation less stressful by buying a Marriott's Waiohai Beach Club timeshare resale because it’s like never leaving the comforts of home while enjoying new and exotic scenery. Contact the professional resale brokers at Premier Timeshare Resale and let them help you find a bevy of Hawaiian timeshare deals so you can buy a Marriott's Waiohai Beach Club timeshare today!